For those who have not yet been exposed to Marvin Gaye Chetwynd's anarchic brand of performance art, the Glasgow-based artist's first major solo show in Scotland provides a good starting point. 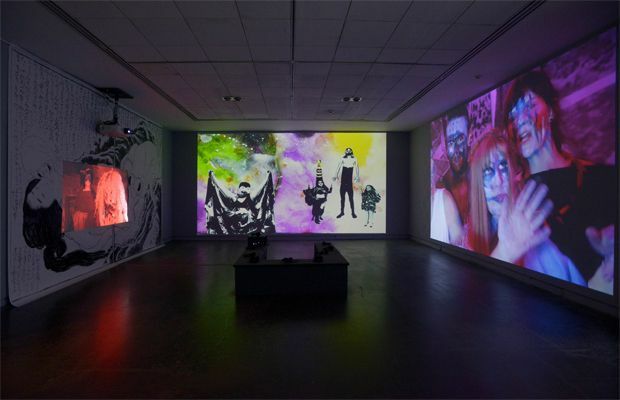 Though known mostly for spontaneous, energetic, and slightly bonkers performances enacted in front of small audiences, Chetwynd has paid more attention in recent years to how her work might engage wider audiences. Thus, Uptight upright upside down attempts to offer something more than just the detritus left behind after the initial performance on the show's opening night. The main gallery space has all the signs of a Chetwynd intervention: huge photocopied images are plastered impatiently across gallery walls, splashes of paint and half-finished gestures, and of course, giant, childishly rendered props. The main image that dominates the space is the famous Shunga illustration, The Dream of the Fisherman's Wife by Katsushika Hokusai. The image could be seen to encapsulate the character of Chetwynd's own work: transgressive, sensual, absurd, and comic, so it's fitting that this powerful image should provide the backdrop for the 'stage'. Many artists incorporate a lo-fi aesthetic into their practice, but it's clear that with Chetwynd there really is no other way: her warts-and-all process is what makes her art hers. But behind the strong style, there are a dizzying number of references and starting points that weave through the frenzy of art making, and to an extent, it's not that important what they are. Indeed, without going through the collection of fanzines presented in the adjoining space, you could never be sure that you're completely 'getting it'. But that's to miss the point: by indulging her own urges and interests, Chetwynd implores us to let go too. The performance artist offers her first full solo show in Scotland.